Pssst … wondering if any of the names mentioned have been featured as Baby Name of the Day posts? If they appear as a blue link, the answer is yes! Just click to read. You’ve settled on the perfect first name, when suddenly you realize that you’re not done yet. There’s a family member that you’d love to honor – but can you really name your new son Algernon? Maybe it isn’t so bad being one of three women named Jennifer in your office, but two of you share the middle name Ann, and the third is Anne. Now you’re in love with the name Ava, but worry that your daughter will be known as Ava LastInitial. Your husband has been arguing that Danger is a great middle name for a boy. He also likes the idea of naming your kiddo Lennon, as in John – but is that too out-there? Speaking of out there, is it really okay to name your daughter Luscinia, or will she have to spell and repeat her name endlessly? So many dilemmas, and one possible solution to them all: look to the middle. 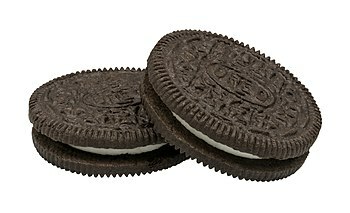 Like the mighty Oreo, the filling in the middle can make a huge difference. For some parents, it is as easy as using a family name – think of the Spelling-McDermott’s Aaron, Doreen, Margaret, and Davey. Other parents have good reason to fall back on names sometimes dismissed as filler – if your grandparents are James and Rose, those middles are meaningful, even if they’re very common. But there’s a certain magic to going big – BIG – with middle names. Choices like Algernon and Luscinia are the Double Stufs of cookie-dom, with more than you expect awaiting. They’re a delight to name enthusiasts, but going big can be useful for lots of reasons. If you’re consider a daring middle, here are seven reasons to go for it! 7. A name that feels overwhelming in the first spot might be perfect in the middle. Fretting that your daughter will dislike answering to Scheherazade? Doubtful that anyone will ever spell Aloysius correctly? Concerned that everyone will shorten Elsinore to Ellie, no matter what your preferences may be? A name that you find extravagant – or even outlandish – might be easier to wear as a middle name. 6. Family names, honor names, place names with meaning, literary favorites all work surprisingly well in the middle. Grandpa Algernon’s name is charming and quirky in the middle. So is Thackeray in honor of your favorite poet, or Ocean for the child of a marine biologist, or Majorca, for the place you honeymooned. Think of Brangelina’s Shiloh Nouvel, the middle name inspired by an architect admired by Brad. There’s a story there, and it could be quite the fun one to tell – especially because, unlike a first name, you only have to tell the middle name story some of the time. 5. It’s a great compromise spot. Your top name is Arsenio. He likes James. To him, Arsenio seems too flashy, too dramatic. You see the appeal of classic James, but worry that he is too ordinary. Or maybe you’re the only grandchild in your generation with a hope of having a daughter, and your entire family is really hoping you’ll pass down family name Edwina, and you’d like to oblige. But Edwina just isn’t your style, and it seems like a lot of name to saddle on a child born in 2014. Where’s the middle ground? In the middle, of course. If there’s pressure to use a name that doesn’t quite suit, the middle makes a convenient hiding spot. James Arsenio gives you some spark. Elena Edwina honors your loved one. It’s not always perfect – but that’s the textbook definition of a compromise, right? 4. 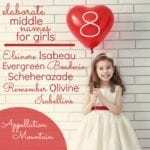 Adventurous middles can spark up a popular or conventional given name. Which one is more memorable: Ava Grace or Ava Berlin? William David or William Deveraux? There’s nothing wrong with the first two combinations, but if you’re using a fairly common given name, a bigger, more daring middle can make the whole name more interesting. It’s doubly true if your surname is common. Betcha there are dozens of boys named Mason Brown. But Mason Obadiah Brown, Mason Lazarus Brown, Mason Swift Brown, Mason Noble Brown, Mason Augustus Brown – any of those is less likely to repeat. 3. It might come in handy. While plenty of us never use our middles, many a famous writer, artist, or other talented person is known by their middle exclusively. Maxfield Parrish was born Frederick Maxfield Parrish. Dashiell Hammett’s given name was Samuel. In both cases, their middles were family names. Yes, there are families of artists and musicians. (Think of Rufus Wainwright, son of Loudon, brother to Martha, uncle to Arcangelo, and father to Viva. Musical talent and a penchant for off-beat names must run in their blood.) But there are also accountants and dentists who are astonished that their children grow up to be sculptors and dancers and such. A daring middle is a ready-made stage name, a possible alternate identity if your Jane feels like more of a Hermione. 2. It’s a way to make a style statement without burdening your kiddo. Are you drawn to names like Bluebell or Steadfast or Keats, but feel like they go too far on the standing-out/fitting-in scale? There’s nothing wrong with choosing unusual names. But you know your family best. If Atlas and Paloma strike you as over-the-top, then tuck him in the middle spot. Parker Atlas and Genevieve Paloma might be exactly the right combinations. The middle names add an extra oomph, something that surprises, but doesn’t need to be constantly explained. 1. As we strive for distinctive names, this can be the best way to go about it. We want so much from our children’s names nowadays. Easy to say and spell, a nice balance of standing out and fitting in, meaningful but not burdensome … everyone’s list is different, but many of us have lists that are extensive, and hard to satisfy. Thinking about your child’s full name – first, middle, and maybe even a bonus middle if you’re so inclined – can provide more options. 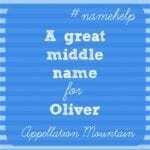 What was your approach to choosing middle names? Are your children’s middles safe, daring, or somewhere in between? A lot of combos I’m loving right now are shorter firsts and longer middles. Jane Xanthe – disallowed because husband dislikes Jane. But look at it. Rich, dramatic. And I love Jane X. Lastname. Aidan Tzvi/Zvi – Neither Tzvi nor Zvi is getting past the husband as a first name. He thinks Australia isn’t ready this name, which nevertheless was my granddad’s. I also really like Elchanan and Peregrine, but best in the middle. I have a not-ranked first and a daring middle. That’s fine, and they kinda “go” but I don’t mind this way at all. My boyfriend’s middle name is Barker, named after an old man that was his fathers neighbor when his father was a child. His first name came from his father’s partners last name (he was a police officer, his police partner). Luckily his partners last name was a common boys first name, so that made it easier for him! I love awesome middle names. Well, I love awesome first names too, but I really feel like I can let loose with a middle. My favorite middle name at present belongs to a friend’s (girl) child. Bay, for the Chesapeake where they live. 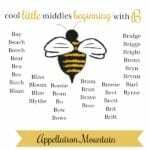 We went the opposite route with our son’s name–a first name that we felt was distinctive enough that he may appreciate having a classic name in the middle. I hate hearing his middle name, James, referred to as “filler” on name blogs and boards. In our case it was chosen with as much love and care as his first name. It gives me more appreciation for middle names I may have once dismissed. I love these suggestions, though, and would definitely consider a wild middle name hiding behind a classic first name to be a lovely surprise! I’m a bit off-beat in my opinion. I advocate for a not-so-norm or mainstream ready first name. I get why parents want to “avoid” the teasing possibilities, but I feel that just encourages the problem of teasing. I mean that is why we fear giving it to our children and aim for putting it into the middle spot where its rarely heard, unless you make it a habit to announce it like an aristocrat coming into a room or a social functional/event: “the honorable Sir Albert Reginald George Phillip III, Duke of whatever.” Granted on paper, the child can be set apart from the other Johns and Jane doe’s, but the first name doesn’t do that alone. I like the idea of letting the child have an identity with the first name alone instead of having to achieve it with the extra middle names attached. I do like having more than one middle name. I feel that it distinguishes the name, completes it, but if the child has to resort to their middle name to stand out, it kind of defeats the purpose of stuffing the middle with rarities that everyone is too scared of using. I’d almost prefer doing the opposite, uncommon common (insert) last name or uncommon uncommon (insert)last name. But that is just me. Not just you, totally agree with you. Daring middles to me seems like a wasted opportunity. I agree with you on a lot of points – I think the middle spot is perfect for names that you love on paper but are somewhat impractical for everyday use, either because they’re similar to a less obscure name and thus would very often be mistaken for that other name (e.g. Sidonie, which sounds very similar to Sydney) or because no one hears or spells it right (e.g. Solveig, Bohdan). I have to say, though, that I cringe every time I hear the name Shiloh Nouvel. It’s great that you like an architect, but why name your daughter after him? It strikes me as pretentious in the worst sort of way. A lot of people I know tend to use family names only as middle names, and in some cultures it is extremely rare to use a middle name for any other purpose but to honour family. Middle names are definitely not viewed in the same way across cultures, even just within Europe and North America. Hmmm. Something tells me that the opportunity to make a bunch of combinations had something to do with this post. Great names and points! We did this for our son (normal first, interesting middle), but really went for broke the second time around. funnily I’ve been wishing lately that we’d given our daughter a fallback second middle, just in case she wants to go by something less conspicuous. My middle name is a long, ethnic family name. It’s also my sister’s first name, although she goes by a nickname. I’m glad it’s not my first name, although I can appreciate the history behind it. It’s definitely preferable to having a filler middle name. My husband and I have selected an interesting middle name for any son we might have: Strange. The first will be a classic family name for both sides of the family, so we figured it would be fun to come out of left field for the middle! RE: #3, the middle can also substitute as a last name, e.g., Angelina Jolie Voight. We went classic/boring and used my maiden name as the middle for both my girls. We have a common last name so chose a more unusual first (Astrid) paired with a timeless classic (Katherine) as the middle. (Bonus points that the middle honors great-grandmothers on both my and my husband’s sides of the family.) Our daughter likes her first name, but I figure the common middle can always be her ‘Starbucks name’ since Astrid may give baristas fits! “Like the mighty oreo” made me laugh. I love oreo names! There is something so fun about discovering someone’s interesting middle—I’d wager more fun for a name enthusiast than coming across a cool first. Because it’s such a surprise! My best friend has a name much like mine, easily dated to the eighties and pretty nondescript for girls our generation. Her middle name though, is Lavinia! I remember wondering where that came from when she told me. Our son Simon’s middle name is Kelly, which is my mother’s maiden name. I don’t think I would have used it as a male first name, and certainly not as a female one, but it felt right as a middle. My daughter’s middle name is Jane, which is pretty common. But it is a name we love, related to two of my literary touchstones. And since her first name is the long and seldom-heard Henrietta I thought a short, simple middle name was preferable to something ornate or flashy. If we ever have another daughter I would love to convince my husband to use either Cornelia or Millicent as a middle name, since he refuses to go for either as a first and I love them both so much. But I think this is a losing battle. Our children’s middle names are rather safe, but rich in meaning for us. Our son, Caleb Nicholas, got his middle name from his father’s first name which was also the name of the first person in his paternal line to come to the Americas. Our daughter, Annabel Hope, got her middle name from my favorite poem, Emily Dickinson’s Hope is the Thing With Feathers. We are expecting a little girl, and her name will be Grace Ramona. The middle is for my beloved grandmother who passed away two years ago. I actually know someone with the middle name Scheherazade! We were shocked at high school graduation when they announced her full name. Her first name was Kimberly, so it was completely (and awesomely) out of left field. My first daughter is Francesca Serenity Rose. Rose was my husbands Grandmas name and I loved virtue names and the Serenity prayer. My husband wasn’t sure but I convinced him as it was just a middle name. My second daughter is Valentina Honor Loren, again I wanted to keep the virtue name going. With Valentina having such a long first name I wanted it to flow and have the same amount if syllables as Francesca. I have two middle names and loved having a long name. I think with middle names you can be more adventurous and I get a lot of compliments on my girls names . What gorgeous names, Emily – thank you for sharing!